Nord-Ostliches Deutschland bearbeitet von C. Vogel. 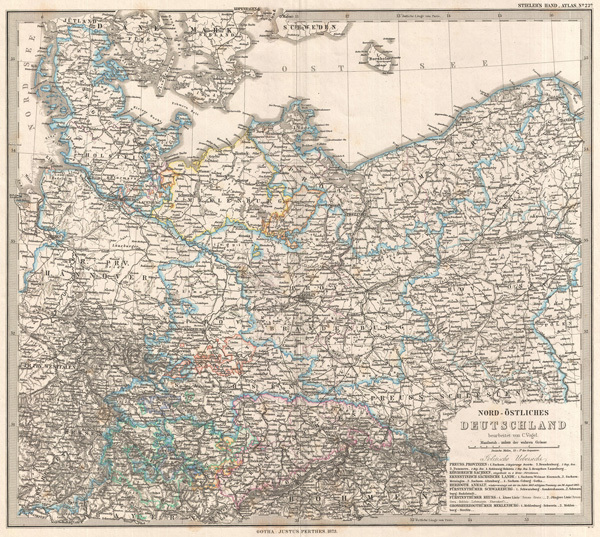 Extremely detailed 1873 map Prussia with relief shown by exquisite hachuring. Covers from Jutland south to Frankfort, and esat as far as Poland Plate 22 in Stieler's Hand Atlas 1875, published by Justus Perthes. Stieler, A., Hand-Atlas, (Gotha) 1873. Phillips (atlases) 4352. Rumsey, 2449.020.